Life’s a beach when the games hit town! With just a week to go until the first ever Beach Highland Games in Kirkcaldy, preparations are picking up pace. The free event, which is being organised by Kirkcaldy4All, is set to take place on Saturday, August 15 and everyone is invited. And the organisers are hoping for a bumper turnout. 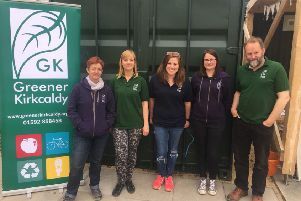 Speaking on behalf of organisers Kirkcaldy4All, Christine May said: “We’re making final preparations, we will have a final meeting to make sure we have got all the bells and whistles organised. “We have been marking out the course on the beach and we know people will be intrigued with what we’re doing. “We are going to mark the course out on the day using pegs in the sand that will be removed the same day. “We have taken a very long measuring tape and three people measured slots along the prom for the placement of stalls. “The Provost Jim Leishman is going to lead and formally open the parade. The parade will start at the main viewpoint opposite Volunteers Green at 9.45am before heading along to Port Brae and then on to the beach. The games are due to be opened at 10am and events are planned to run until around 1pm. This year’s inaugural event is being sponsored by Kirkcaldy and Central Fife Sports Council. Christine continued: “The day will have all the usual Highland Games events including the pipe bands, Highland dancers, athletes and heavy events. “We’re delighted with the response we’ve had in terms of entries and the support we have had from local traders has been fantastic. The Kirkcaldy event is the brainchild of local men Andrew Bowie, who runs Peachy Keen in Kirk Wynd, and Don Campbell, a former Highland Games competitor from Lochgelly. The only other games staged on sand take place on the other side of the world, in Australia. The Beach Games will be the first ever full Highland Games staged on a beach, and will feature dancing, the popular heavy events, running, and pipe bands. Organisers hope the timings of the event, which tie in with the tides, will encourage spectators to also visit the town centre, giving a spin-off to local businesses.